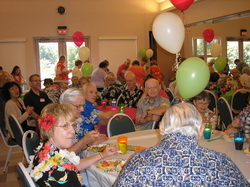 Twice a year, in the Spring and in the Winter, club members get together for a social. The event is held in the Evergreen Room where members bring a dish to share. Raffle tickets can be purchased for a chance at prizes such as a hard drive or other computer peripherals. The Spring Social includes the announcement of the election results for the Officers and Directors for the coming year. Other special events, such as Computer Fairs, are held as announced. For photos of our social and other events, visit our Galleries.